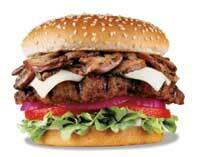 Fast Food News: Portobello mushroom burger at Carl's Jr.
Portobello mushroom burger at Carl's Jr.
Carl's Jr. introduced, yesterday, their new "Portobello Mushroom Six Dollar Burger." The hamburger has "Portobello mushrooms sliced and sautéed with garlic and parsley" on their 1/2 pound burger with swiss cheese. Their advertising tag line for this burger is: "skip the dinner jacket and go for the drive-thru." I don't know about you, but I've never suddenly felt underdressed just because somebody put some mushrooms on my burger, but hey, what do I know? I never understood the name "Carl's Jr." What of Carl's is junior, and why not just call them all Hardees? Being from Southern California, here is a little I know of the Carl's Jr franchise: Carl Kartcher (not sure of the last name spelling) the founder of the restaurant started with a full service restaurant called Carl's in Anaheim, CA. When they started their fast food restaurant they called it Carl's Jr as an offshoot of the main restaurant. I didn't even know of Hardees until this evening when I saw a commercial on my hotel television in Florida that was a "Carl's Jr" commercial I've seen in CA, however, it ended with the same logo that said "Hardees." I was very confused, which prompted me to go online and search what I could find out about this different name. I hope I've helped a bit. We dont hav those burgers in my country. Sad. . . . ..